Regimental Badges, like Colours and titles, epitomise a considerable amount of history. 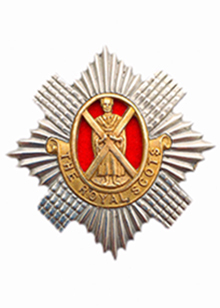 From the earliest regulations The Royal Scots were entitled to bear on their Colours the Royal Cypher within the Collar of the Order of the Thistle with the badge appendant. The earliest surviving Colours, presented in 1775, carry that badge. 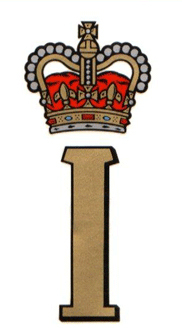 The Royal Cypher changes with the Sovereign, as does the pattern of the Crown, depending on whether the Sovereign is a King or a Queen. The Collar is more fully described as ‘alternate thistles in gold and purple, and the crossed double sprigs of rue, green leaves and brown stems’. The officers cap and collar badges date from 1931 when they replaced the patterns adopted in 1881 which were identical to the cap badge worn by officers of the Scots Guards. The 1931 change applied only to the Regular Battalions and the 7/9th (Highlanders) Battalion continue to wear the former (Scots Guards) pattern until their amalgamation with the 8th Battalion in 1961. The present pattern had previously been worn on the buckle of the officers’ full-dress waist and cross-belts. It is formally described as the Star of the Order of the Thistle. Warrant Officers also wore the officers’ cap and collar badges, although the collar badge worn by Warrant Officers Class 2 is brass rather than bronze. Colour Sergeants wore the officers’ pattern cap badge but with soldiers’ collar badge. The soldiers’ cap badge dates from 1890 when it was adopted to replace two slightly different badges worn respectively by the 1st and 2nd Battalions. The badge chosen had previously formed the centre-piece of the 1st Battalion’s helmet plate. The star and cross are silver with the remainder in gilt. The 1st Battalion wore a piece of red cloth behind the figure of St Andrew, and the 2nd Battalion wore green. A similar badge, but with a solid gilt backing to the figure of St Andrew, had been worn by the 2nd Battalion until 1890, and this badge, with minor modifications, is currently worn by pipers of the Regiment. 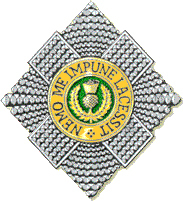 Colour Sergeants and below wear as their collar-badge a gilt Thistle of a pattern introduced in 1881. The Regiment recruited its soldiers from Edinburgh, the Lothians and the former county of Peeblesshire. The Regimental tartan was Hunting Stuart (left) which was worn by all ranks except Pipers who wore the Sovereign’s personal tartan, Royal Stuart (centre); an honour granted by King George V to mark the tercentenary of the Regiment in 1933. The colours of the Regiment used for ties (bottom, second from the right), scarves etc are Oxford Blue, Gosling Green and Peony Red.